REEL MEDICINE is just what the doctor ordered for a get away from the hectic lives we all live. Reel Medicine is a very private and mostly secluded Blue Ridge cabin rental that sits just feet away from the banks of rushing Big Creek. As you get to the property you will notice the coziness that meets you as you cross the beautiful "Old Covered Bridge". The cabin is tucked under a great canopy of large hemlock, pine, and soaring hardwoods giving you the fell of the way a real log cabin should feel. On your way to Reel Medicine, you will pass Lake Blue Ridge, for boating and fishing, drive along the upper Toccoa River, for trout fishing (in the trout capital of Georgia) and tubing, and Shallowford Bridge, which is a staple in the community that is known for having great adventure in the area. There is Shallowford Bridge tube rentals and Toccoa Valley Campground for tubing, both within 5-7 minutes from the cabin. You will also pass the famed Toccoa Riverside Restaurant, great for outdoor dining on the banks of the Toccoa River. Also, close by the cabin is the Benton McKaye hiking trail, the largest spur of The Appalachian Trail, Toccoa River Swinging Bridge, and several waterfall hiking trails, including Sea Creek Falls, Fall Branch Falls, and Amicalola Falls (a 729 foot tall waterfall). This cabin is in the "Aska Adventure Area" and is right in the middle of all of the action of outdoor fun. The cabin itself is very inviting once you walk thru the doors. Upon entering you will see the vaulted ceilings in the living room and dining room, providing an expansive feel, a very warm and welcoming living area, with a floor to ceiling rock real wood burning fireplace, and comfortable living room furniture. To the right you will find an eight person dining table and a lovely sitting area, perfect for book reading and having some alone time while taking in the view of the back yard. There are two bedrooms on the main floor and one bath, one bedroom with a queen bed and the other has some options. You can choose to have a king bed or two twin XL beds, these beds are specifically designed for this, so the king will be comfortable. On the main floor you will also find one full bath and a laundry room with full size front load washer and dryer. Also, on the main floor, is a updated and fully stocked kitchen, with stainless appliances and all the comforts of home. All of the TV's in the house are "High Def" TV's, including the one in the living room which also has a DVD library, a game library, and WIFI. Upstairs is the complete master suite. There is a king size bed, a full bath, walk in cedar lined closet, and cozy sitting area. The master suite is a large suite, and the bed is pushed all the way to the far wall, the front part of the master suite overlooks the living area below. Outside.......well it is as close to perfect nature as you can get. Almost the entire property is flat, and has easy access to the cool waters of Big Creek. There is a beautiful fire pit with chairs and stumps to sit on. Also, there is a hammock to rest and enjoy the beautiful sounds of the rushing creek. The back yard also has its very own walking trail, even with a foot bridge, and it is even lit for night time strolls. Across the creek is a true amenity that helps with privacy, there is a beautiful small pasture and the base of a mountain to look at, but absolutely no houses in sight across the creek, making for extreme privacy. One last amenity that everyone wants is the hot tub. There is a hot tub on the screened in porch for your enjoyment. Also, on the screened in porch, there is a table and chairs, rocking chairs, and plenty of room if the kids wanted to sleep out side. The Creek - Big Creek is a native trout stream, and is one of the great trout habitat's in all of North Georgia. The trout flourish in the cool and oxygen rich waters. Fly fishing is the only allowable style of fishing in this small stream, and it can be challenging, due to so many trees, but can be very rewarding. This is a catch and release stream only in this area, as the home owner's takes the little extra amenity on their own and they stock the stream with rainbow trout. So, please enjoy your time, while clearing your head in this beautiful piece of the Blue Ridge Mountain fresh water. So come and enjoy the refreshing sights, sounds, and feeling of "REEL MEDICINE", it's just what the doctor ordered! 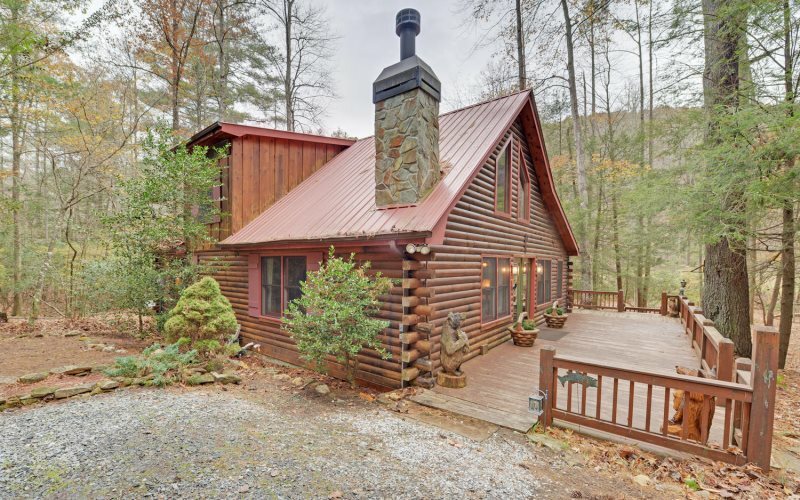 This Blue Ridge, Georgia Mountain Cabin Rental is located approximately 20 minutes from Downtown Blue Ridge, GA. The cabin is on Big Creek, in the Aska Adventure Area, which is very close to the Rich Mountain Wildlife Area, USFS, Adventure Trail Rides for Horseback Riding, Blue Ridge Canopy Adventures, and Lake Blue Ridge, Sandy Bottoms Canoe Launch, the Toccoa River Swinging Bridge, Toccoa River Tubing Adventures at Toccoa Valley Campground, and Noontootla Creek Farms. REEL MEDICINE is very private and is considered a secluded waterfront Blue Ridge Cabin Rental on a creek. Absolutely loved it! So peaceful and relaxing and the interiors are superb! We will definitely be back! Great interaction with the staff, they were very friendly and helpful. This cabin is in a amazing location. 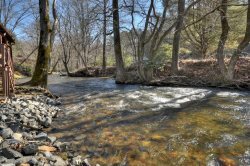 Its close enough to town but also secluded and the creek behind the property is great. Our family loves staying here. Everyone who I dealt with was courteous, friendly and knowledgeable. It was a magnificent property and I would stay there again, mainly because of the position. I've already recommended Georgia Mountain cabin rentals to some friends. I've already recommended Georgia Mountain cabin rentals to some friends. I loved how the back yard was set up, with the fire pit and the property being right on the creek. We had great time ! Thanks a lot ! Great cozy and secluded cabin! All the amenities. On the creek with lots of trout and chairs to sit and enjoy. Great fire pit and hammock. Love the screened porch to enjoy dinner then take a dip in the hot tub while enjoying nature. Fully stocked kitchen. All we needed to enjoy our week. Our 5 year old loved the Reel Medicine cabin so much he asked if we could buy it and never leave. This is the second time we have used this company to rent a cabin. We will definitely be coming back! Super easy rental process and friendly staff make the experience overall pleasant. My 5 year old is hooked on Blue Ridge so we can't wait to see what it looks like there in the winter! The team was great. At least our interaction with them was. It was our first vacation in almost 12 years, and it certainly did the trick. It was fun, our kids enjoyed it, and we were able to relax the entire week. We will be back again at some point. The cabin is everything you could want in a mountain cabin. Beautiful, comfortable, and well maintained. The back yard is peaceful and the large stream that runs through it will put you at ease with its soft roaring sound. Visited for our honeymoon everything was perfect! We leave in the morning to go back home, but this has been an amazing stay!!!! So many fun memories have been made at this cabin. It's been a much needed getaway. I hope everyone who stays here after us has just as an amazing time as we had!! The Fraser's!! THIS CABIN IS AWESOME! We have a tradition of celebrating my mom's and my sister's birthdays every year with a weekend getaway at the end of July. We have been to Asheville, Gatlinburg, Pigeon Forge, Blue Ridge, and a few other destinations over the years. Reel Medicine was hands-down the BEST cabin we have stayed in yet. The huge screened porch with hot tub was fabulous, and the stream in the back yard was great for fly fishing or a little snooze in the hammock. The furnishings are very comfortable and seem to be of the highest quality, and the decor is just perfect. The owners have thought of everything - wood for the fire pit, well-equipped kitchen, tons of seating inside and out, books, games, puzzles. The only negative thing I can say about this weekend is that it went by way too fast, and we hope to rent it for a whole week next summer! AMAZING & we will be back! Cabin was wonderful. Had some issues with the early check in I paid for due to over booking and we had to check in later but it was taken care of and they made up for the confusion. Property was beautiful but do to the over booking cleaning lady didn't finish till after we checked in and got to the cabin. Had to wait for her to finish but place looked great so no biggie there, it was worth letting her finish. Land was magnificent. My kids loved playing in the creek and having smores by the fire. Had a bear visit but ment no harm. Beautiful by nature. Best sleep iv had in awhile with the wonderful soft beds. Hot tub was perfect and we enjoyed playing games on the amazing large enclosed back deck. Sad to leave after spending the whole week. We will definitely book this cabin frequently. This was our 2nd time as my husband and I honeymooned there in fall and that was another wonderful experience as well with lovley colorful views from the cabin. We had a wonderful few days at this little piece of paradise. We enjoyed listening to the creek and feeding the fish so relaxing...we would love to return some day. Thank you for sharing your beautiful place!